Background: Epilepsy is a neurological disorder manifested by recurrent episodes of seizures, loss of consciousness, and sensory disturbances. Epileptic seizure is generated due to functional disturbance within the population of neurons. The present study was conducted to evaluate the effect of various classical neurotransmitter and neuropeptides in epilepsy in humans as well as in rodents. Objectives: The present study reviews the role of various brain neurotransmitters viz. GABA, glutamate, biogenic amines, and neuropeptides in the prevention and regulation of epileptic seizure in humans as well as in various animal models of epilepsy. Discussion: We provide evidences, from various clinical and pre-clinical studies, regarding role of individual brain neurotransmitters in the pathophysiology of Epilepsy. Gamma Aminobutyric Acid (GABA) hypoactivity induces dopamine hyperactivity as dopaminergic neurons are affected by the inhibitory influence of the GABAergic system through GABA (A) receptors. Glutamate hyperactivity is exerted via presynaptic N-methyl-D-aspartate (NMDA) receptors and postsynaptic ionotropic glutaminergic receptors that strongly inhibit serotoninergic neurons and induce epileptic seizures, respectively. This study suggests that there is an increase in the electrical activity of cortex on topical application of Ach following the administration of pentylenetetrazole. 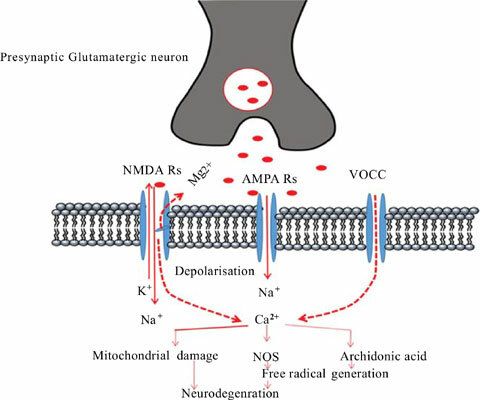 However, the neuropeptides like substance increase the glutamate-dependent excitotoxicity by acting on the NK1 receptors. The study also suggests the involvement of nitric oxide mechanism in epilepsy by over-activation of NMDA receptors. The endocannabinoids, such as Cannabinoids produce neuroprotective effects by antagonistic action on NMDA receptors and inverse agonism on CB1 receptors. However, the chronic overexpression of Adenosine Kinase (ADK) causes seizures in epilepsy. The anticonvulsant actions of adenosine are mainly mediated via activation of A1 receptors. Conclusion: Thus, the present review suggests a possible involvement of neurotransmitter and neuropeptides in epilepsy in humans and rodents. Epilepsy, kindling, neurotransmitter, pentyletetrazole, oxidative stress, NMDA receptors.